What You Didn't Know About What You Already Know About Easter Bring forth your baskets so that we may fill them with these five fun facts about the spring holiday. 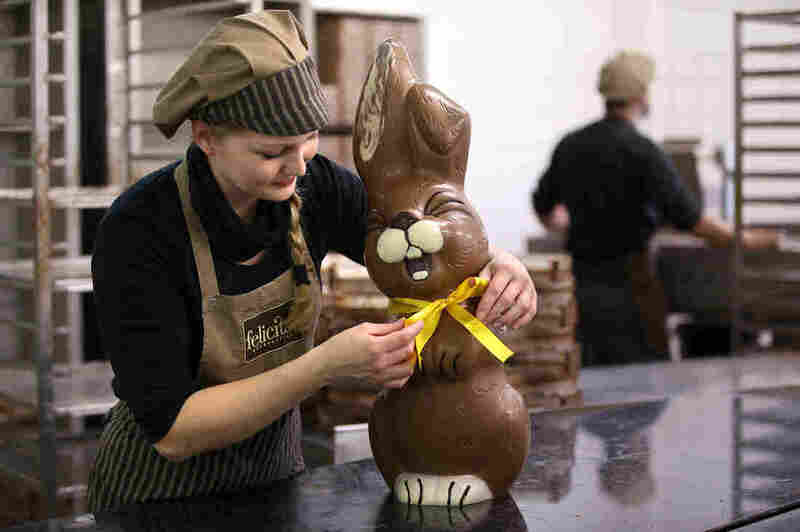 Employee Sandra Jaeckel adjusts a ribbon around the neck of a giant chocolate Easter bunny at the production facility of Confiserie Felicitas chocolates maker in Hornow, Germany, in 2014. Through centuries and across cultures, the holiday's iconic customs have been built upon with the help of storytelling. And the cotton-tailed creature that leaves us chocolate and eggs has a longer tale. The story of Easter is as much rooted in paganism as it is in Christianity. The holiday owes its name to Eostra, the Germanic goddess of spring and fertility. A little girl found a bird that was close to death and prayed to Eostra for help. Eostra appeared, crossing a rainbow bridge — the snow melting before her feet. Seeing the bird was badly wounded, she turned it into a hare, and told the little girl that from now on, the hare would come back once a year bearing rainbow colored eggs. But because Easter's namesake is held up exclusively by this myth and by Bede's The Reckoning of Time, it continues to be a contentious scholarly debate. Legends featuring bunny imagery associated to Easter continued to be written down in 1500s Germany and the first story about a rabbit hiding eggs in a garden was published in 1680. As many Southwestern German immigrants settled in America, the Easter Bunny lived on in Pennsylvania Dutch tales of the Bunny as the "Oschter Haws," where Germantown, Pa., children were gifted with eggs in their Easter bonnets that, today, are replaced by Easter baskets. Egg decorating is at least a 60,000-year-old activity, practiced by the likes of Egyptians, Persians, Greeks and Kalahari Bushmen, who engraved ostrich eggs. Before giving colored eggs found its way into the modern Christian tradition, early Mesopotamian Christians dyed eggs red to symbolize the blood shed by Christ during his crucifixion. An "Easter egg," as it relates to hidden symbols or messages planted in a pop culture medium by its creator, was first coined by the Atari programmer Warren Robinett, who designed a secret room in the 1979 video game, Adventure. It wouldn't be Easter if we didn't eat candy animals. Easter bunnies turned edible in 1800s Germany when they were first made of pastry and sugar. Animal rights activists have protested against the ritual of coloring chicks by infusing dye into the embryo before it hatches. Speaking of dyeing chicks, one of the reasons Peeps keep coming back every year is because they are so resilient and multi-purpose. Unless you're gulping down the marshmallow birds for a challenge, a common practice is to microwave Peeps. If you think that's inhumane, some enthusiasts even take it further with Peep jousting tournaments. Just Born, the company who makes the marshmallows, even conducts research with Peeps. All Peeps are told the potential risks before voluntarily submitting to testing, of course. A niche Peep diorama culture merges fine art history with the sugar-coated goodies. The first Peep diorama contest was held in 2004 by the St. Paul Pioneer Press. Take a look at the winner of this year's Washington Post 'Peep Show' diorama contest. Because, who actually eats them? Now, I wonder how future generations will adopt the American tradition? Emma Bowman is an intern with NPR Digital News. An earlier version of this post stated that the Easter Bunny character first appeared in Bede's The Reckoning of Time. The legend first appeared in Teutonic Myth.